This latest novel by Manda Scott is a triumph. It is even better than her fabulous Boudica series and deserves to hit the best-seller list. The story is incredibly well researched and so powerful and captivating that its bitter-sweet ending has the potential to reduce you to floods of tears. 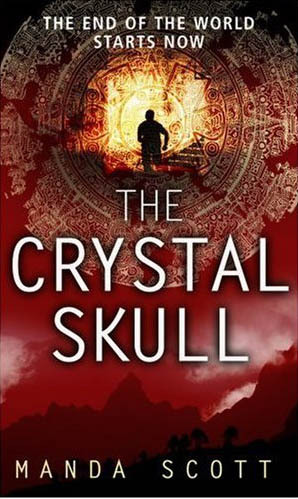 THE CRYSTAL SKULL is a mix of historical facts, Armageddon legend and fiction. Whether or not you believe the end days predictions of Nostradamus and others like him, some of them clearly state that 13 crystal skulls were made by the Mayan civilization five thousand years ago, specifically for the purpose of protecting mankind from Armageddon. Legend also tells us that the date for the end of life as we know it is December 21st 2012 – or, rather, the Mayan calendar calculates this date as being the end of the fifth age; when the sun reaches a certain position in the galaxy – with wide scale man-made destruction set to occur on that date. Scott's novel cleverly combines this legend with a present-day cat and mouse chase involving Dr Stella Cody and another plot featuring Elizabethan physician, Cedric Owen. The different stories are perfectly intertwined and seem to swap over just when you are so caught up in the story that you don't want to be interrupted. Cedric is the latest in the long, unbroken line of a family destined to protect the blue heart stone – a life size crystal skull with mysterious properties that contains the heart of the earth and has been made to save mankind from itself. All skull bearers up to Cedric have paid for their service with death and, knowing the fate that awaits him, Cedric travels to South America to discover the secrets of his skull. His journey eventually brings him back to England, to hide the skull, from those who would have it for their own selfish ends, until the end times are near and the next skull bearer is led to finding it. This person is Stella Cody. Newly married, her husband, Kit, an academic at St Bede's college, Cambridge, offers her the ultimate wedding gift. She is a keen caver and Kit takes her to a cave that has not been explored for over 500 years. His life's work revolves around Cedric Owen's blue heart stone and he has just discovered its long-hidden resting place. Although the discovery is Kit's, it is Stella that dives into the water to retrieve the stone and it is her that the stone bonds with. Guided by the stone's songs and its uncanny love for her, she fills the gaps in what is known about the stone and discovers that only she can save the earth from destruction. The nail-biting final scenes leave you exhausted. You are there with Stella as she struggles to complete the task for which she has been born. Will she make it in time and will she have to make the ultimate sacrifice for the stone in her care? It took me just two days to read this book. It has left me wondering how much truth there actually is in the 2012 prophecies and how much longer we can continue to abuse our beautiful planet before it turns on us in revenge. Manda Scott has done such a fabulous job with THE CRYSTAL SKULL. She has long deserved wide acclaim for her work. I hope this is the book that finally gives it to her. Read more reviews of THE CRYSTAL SKULL, here and here.